Premium Hearing is independently owned and operated by a registered Audiologist in the Niagara Region. We strive to provide our patients with exceptional customer service and patient-centred care when working alongside them on their journey towards excellent hearing. Our hearing care is delivered by a professionally qualified Audiologist Leiyla Bahbahani who is regulated by the College of Audiologists and Speech Language Pathologists of Ontario (CASLPO) Our goal here at Premium Hearing Clinic is to improve the quality of life of our patients by providing superior audiological services, hearing aid products and other assistive listening devices to enhance your communication lifestyle. We deal with all major hearing aid manufacturers, which means that our patients will always receive what is best for their specific hearing needs. We aim to improve the quality of life for our patients by providing exceptional audiology services in a compassionate environment for all ages. We invite you to explore our website and learn more about our products and services. We hope to see you in our state-of-the-art facility located at the Lincoln Kingsway Plaza in Beamsville. Welcome and thank you for visiting our website. 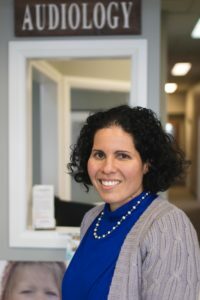 Premium Hearing Clinic is independently owned and operated by our Audiologist, Leiyla Bahbahani. After several years of working in the private and public sectors, she decided to open her own hearing clinic right here at home in Beamsville. Over the past decade, Leiyla has worked closely with children and adults who has been affected with hearing loss. Hearing is an important sense and it connects us to the world around us and within our social network of friends and families. When we do not hear well, there is a disconnection from others and the social implications that hearing loss can have on a person in their lifestyle, whether at work, school or within the community is significant and can be over-whelming. Poor quality of life that arises from lack of engagement in their social environment and with their friends and loved ones. Leiyla also has experience with helping to identify the child who has hearing loss and to overcome the barriers that are associated with hearing loss in children through proper amplification to enable the child to hear audible speech sounds in their learning environment. Often a child is mis-diagnosed as inattentive, distracted and low performance at school when the underlying cause is a hearing loss, which can be aided with an assistive listening device. The counseling and advice that you will receive is warm, professional, thorough and easy to understand.